Warts are caused by human papilloma viruses (HPV) that can affect any part of the body including hands and feet. Verruca palmaris (VP) is a common manifestation due to HPV infection in keratinocytes of the palms. In the conventional system of medicine, VP is commonly managed through cauterisation, cryosurgery, surgical removal or topical ointments, which have many limitations. Scientific documentation for the treatment of VP by homoeopathic medicines is very scanty. In this context, the present case report is of a 40-year-old male patient, who had multiple warts on his right palm for more than 2 years. The patient was treated previously with allopathic medications and external applications, without any significant improvement. Homoeopathic remedy (i.e. Natrum mur) was initially administered in 30C potency for 30 days, but no improvement was observed in the patient. Interestingly, when the potency was increased to 200C, a speedy recovery was observed and the patient was fully cured within 3 months. Therefore, it can be concluded from the case study that VP, when treated on the basis of the totality of symptoms, with an accurately selected remedy in suitable potency results in cure. In this particular case, Natrum mur worked well for warts on the palm. 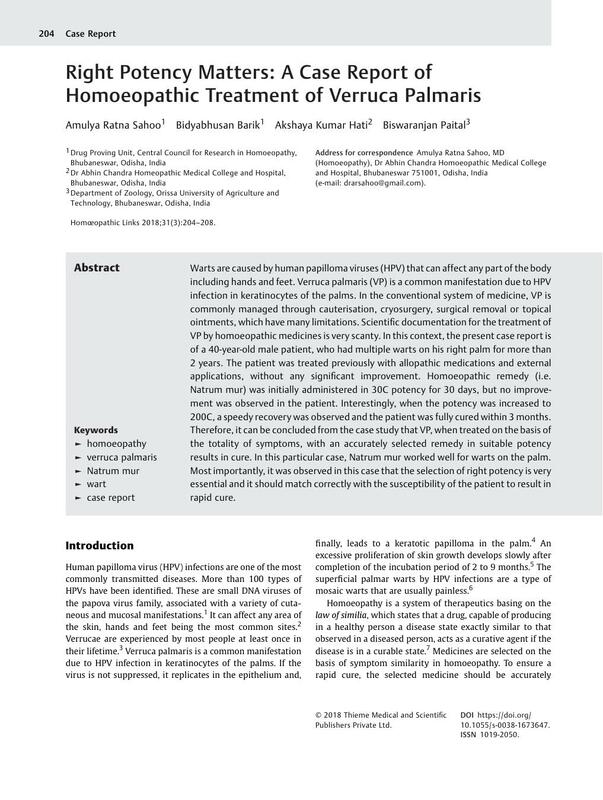 Most importantly, it was observed in this case that the selection of right potency is very essential and it should match correctly with the susceptibility of the patient to result in rapid cure. The patient was very happy and expressed his gratitude by saying, ‘I had not expected such a quick improvement and complete cure’. The warts had affected negatively his personal and professional life, so he was really glad after getting rid of them.